So you’ve decided to start meal planning? WAY TO GO! Meal planning is so awesome because it helps you save SO MUCH money, time and energy. 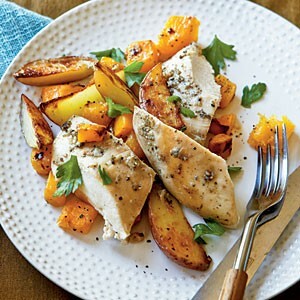 Imagine whipping up a bunch of go-to budget-friendly meal plans you can prepare quickly and enjoy without stress. In fact, with a little practice, you’ll be able to spend just an hour or two on a Saturday or Sunday preparing a WHOLE WEEK’S worth of food—cutting your weeknight kitchen time down to zip, zero, zilch, nada! I know—sounds WAY too great, right? 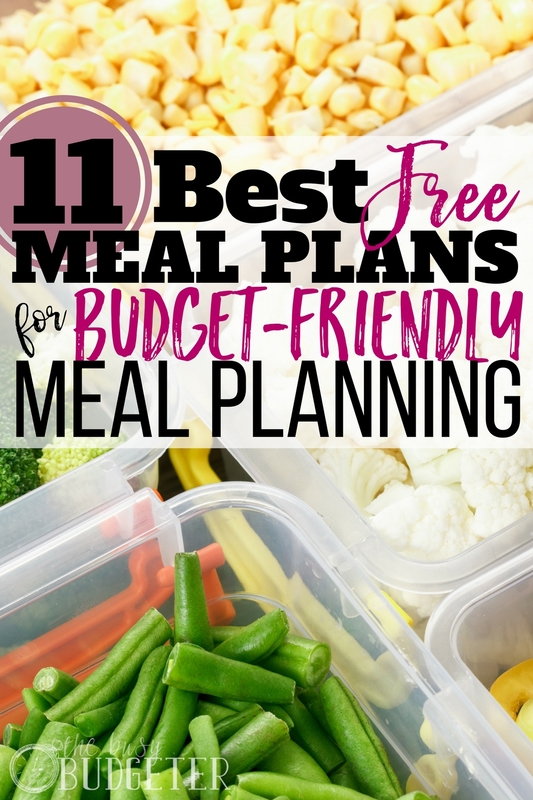 I swear it’s for real and it’s totally going to be OK because in this post, I’ve collected not only the best FREE meal plans, but the best free BUDGET-FRIENDLY meal plans I’ve found online. When it comes to meal planning, there’s one BIG challenge: coming up with WHAT to make. No matter which meal planning method you follow, sometimes you’re still left scratching your head, wondering what exactly to put on the menu. You might have the ingredients but not the answer. Well, to make things easier, I’ve rounded up the best free meal plans (on the cheap) I could find on the Internet. These budget-friendly meal planning options not only provide you with ideas for WHAT to make for dinner, but you’ll also get a plan for exactly how to make each recipe—plus, you’ll save lots of money in the process. When you’re meal planning on a budget it can be hard to get creative. (Taco night again??) Plus, most of us aren’t gourmet chefs or even short order cooks (although you may feel like it sometimes), so coming up with new, interesting options can be tough. Check out these budget-friendly meal planning options for inspo. 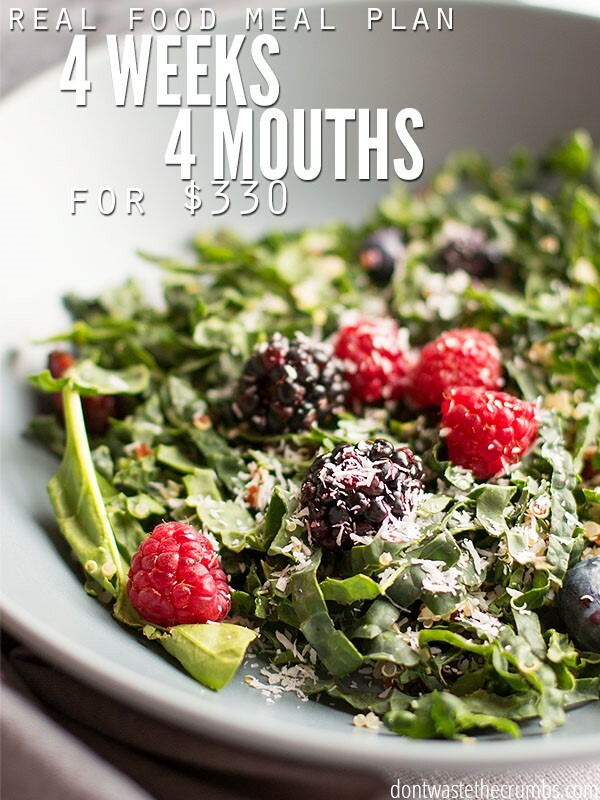 Mix and match any of these best free meal plans or just pick one and carry it out. Either way, there are plenty of delicious options that can make your weeknights way easier. Opt for fast weeknight meals, weekend prep, or other options that fit your schedule. Just remember: the key to being a good cook is to remember not to take things too seriously. Recipes don’t have to turn out perfectly or be uber complicated to taste good. With just a little time in the kitchen, you can cook up a surprising number of yummy meals, even if you’re not a great cook (or don’t think you are). Most of these easy recipes require very few chef skills and if you can follow basic instructions, they’ll turn out just fine. And if it doesn’t turn out? Well, you can always opt for grilled cheese and tomato soup! So check out these best free budget-friendly meal plans from around the web. 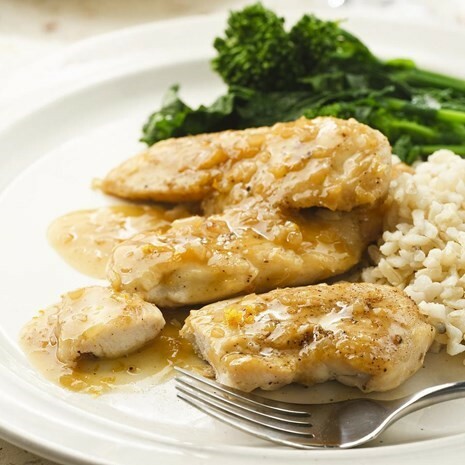 Chicken recipes are perfect budget-friendly dinners and reliable recipes you know your family will love. If you’re a fan of Tyson Grilled Chicken, you know how creative you can get with just a couple chicken breasts and some pantry staples! There are 12 meals in this free meal plan and each meal is designed to be healthy, delicious, AND under $3 per serving—that’s pretty hard to argue with! 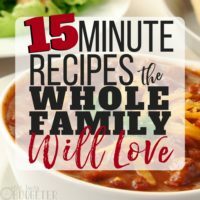 This mom believes that meal planning shouldn’t be impossible for a family on a budget—and I totally agree! In this frugal meal planning series, each plan is packed with breakfast, lunch, dinner, AND snack options for an ENTIRE WEEK, plus shopping lists and recipes—all for just about $80 per week! Some of the meal plans even include gluten-free and vegetarian-friendly options. 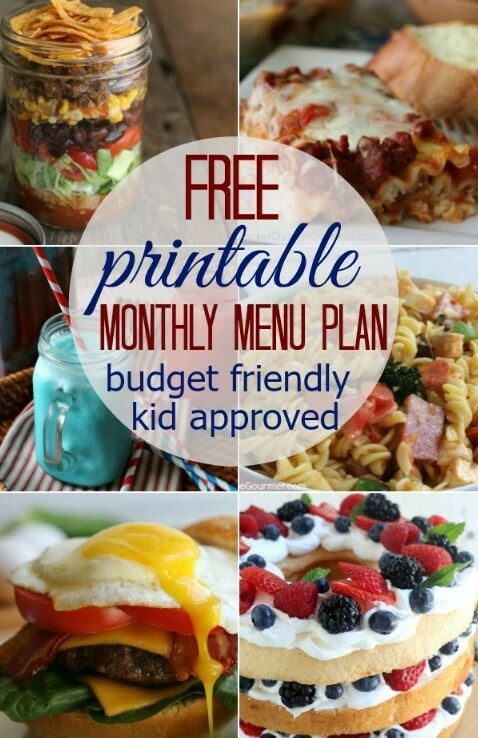 This free meal plan is PACKED with great recipes—and they’re ALL budget friendly, kid-tested and approved, and designed with holidays and special occasions in mind! You can get three YEARS of Monthly Budget-Friendly Meal Plans + Printables for FREE on this site. (Wow!) Each month includes dessert options, suggestions for holiday meals and special occasions, and a meal planning calendar. If there’s one thing I love, it’s budget-friendly meal planning that doesn’t rely on heavy food. 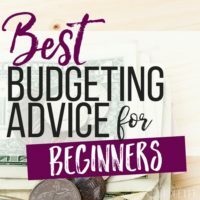 Cooking on a budget does NOT mean you have to give up on your diet! This meal plan includes over 100 recipes that all fall under $2.50 per serving and are designed to be super flavorful, delicious, AND healthy. Almost all the recipes are built around ingredients that you probably already have in your kitchen, so take your pick and enjoy! This entire-month meal plan is built around 4-5 main ingredients like chicken, ham, beef, or turkey and includes and encourages great ways to use leftovers to cut down on your grocery budget. (Talk about the full package!) 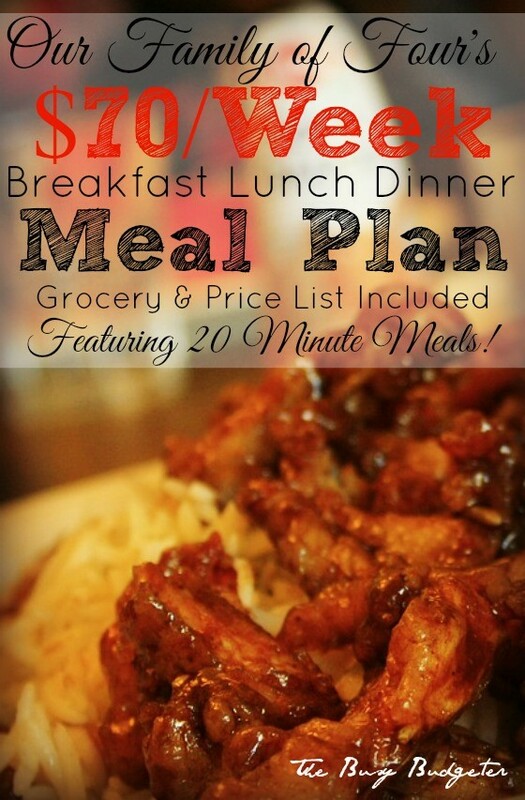 Overall, this menu plan for 4 weeks breaks down to a little over $80 per week for a family of four. There are breakfast, lunch, and some dessert options included as well. The Real Food Menus series has a ton of meal plans and budget-friendly grocery shopping advice, too! This vegetarian-friendly free meal plan for a family of three is all about making the most of simple ingredients, pantry staples, and some creativity (but not too much) in the kitchen. While two weeks of meals on a frugal $20 budget seems like an impossible task, these meal plan makers came up with an Aldi shopping list and recipes built to keep your budget intact! This meal plan is entirely vegetarian (not for everyone, I get it), so keep in mind that while you can definitely add meat into some of these recipes, it will wind up increasing your budget! One of the best free meal plans you can have is one that isn’t entirely dependent on seasonal ingredients, weather, or jam-packed schedules. Universal meal plans are perfect for families who don’t have time to adjust based on last-minute changes or unavailability of ingredients. Life as a Mom meal plans are just that: universal, perfect for any time of year, and easily adjusted for night-of cooking or make-ahead. Each weekly meal plan includes a grocery list, printable recipes, and a weekly meal planner. Handy! 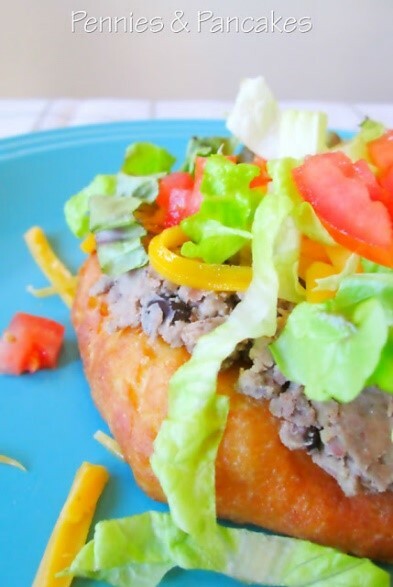 Inexpensive, creative, and delicious meals, PLUS a streamlined, minimal shopping list? What more could you want?! 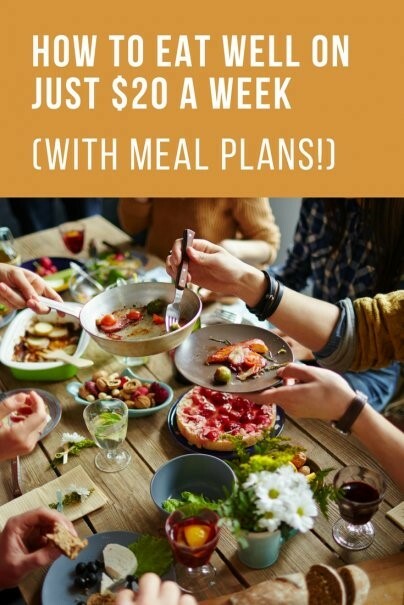 This five meal, one dessert meal plan is budget friendly, includes super simple recipes with shopping lists that could fit into one basket (not a cart! ), and will impress even your toughest critics. Budget meal planning requires a little extra creativity and this meal plan is definitely not falling short there! This family of five really knows how to pack a punch in a frugal grocery budget! This 30-day free menu plan includes a shopping list (and recipes!) and an itemized, daily meal breakdown that makes it super easy to stick to budget, follow along, and save money while still coming up with plenty of creative meals for the family! And you know if these meals are approved by kiddos under the age of 10, you’ve gotta be doing something right! 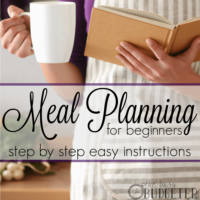 While I have tons of meal planning options and recipes here at Busy Budgeter, this free meal plan is one of my favorites because it’s really the ultimate money-saving meal plan. Plus, it’s a great meal plan if you frequent takeout places and crave your favorite dishes. The leftovers stretch and they include healthy veggies and lots of natural (non-processed) options, which is nice if you’d like to go for healthy dishes. Plus, the protein is totally swappable—if you find a better deal on beef or even shrimp or pork, you can switch it out for chicken in the dishes. There are tons of cheap meal plans out there—enough to eat restaurant (or at least take-out level) quality meals every night. You’ll save plenty of money by planning ahead and you’ll find new ways to feed a family of four for just a fraction of what many of us spend. 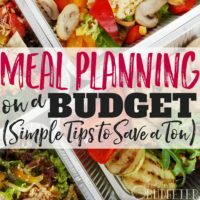 If you’re trying to save time, money, and find ideas for meal planning on a budget, check these free meal planning options out. I’m sure you’ll find something you and your family will love. 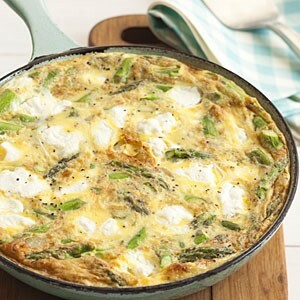 These best free meal plans might just end up in your regular meal planning rotation! Update: If you're struggling with chronic disorganization? I know exactly how you feel… 3 years ago I was a mess. I spent tons of money on groceries only to end up at the drive-thru. I’ve learned something since then… the key to change is keeping it super simple. If you’re ready to finally get this under control, you can sign up for our FREE Home Rescue Challenge and we’ll walk you through the 3 simple routines that will change everything about the way you manage your home. Everything so informative, I love it! 🙂 Thank you for sharing this, definitely i’ll take note of this! So many useful information …. Thank you so much ! 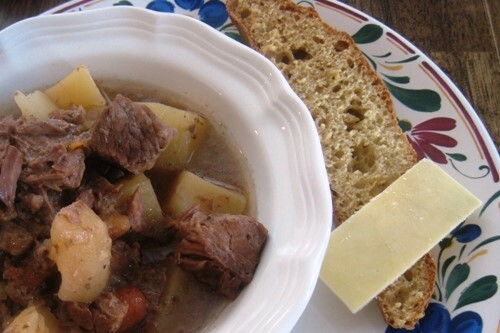 These are some great recipes and I am definitely trying out few of them this weekend. I have one question though, do you happen to have any healthy meal plans, preferably aimed towards loosing weight, that you can cook in bulk? I can finally beat inflation with these hacks! Bye-bye restaurants, it’s time to do some home cooking now! Hi, Rosemarie! I am thankful with these meal plans. I am using this to start a delicious and affordable meal for my family. Xoxo.